Lafayette, LA – Raising Cane’s has always valued its commitment to pet welfare. After all, the Louisiana-based company known for its ONE LOVE – quality chicken finger meals – is named after its founder’s beloved yellow Lab, Raising Cane. Which is why every holiday season, Raising Cane’s sells limited-edition plush puppies. Customers are invited to purchase a collectible stuffed mascot to help pets in need. For 2018, Cane was dressed as Frosty the Plush Puppy. Raising Cane’s also debuted a limited edition 2019 Cane III Puppy calendar. The best part is that 100% of the net proceeds from plush puppy and puppy calendar purchases are donated to pet welfare organizations in each of Raising Cane’s local communities. 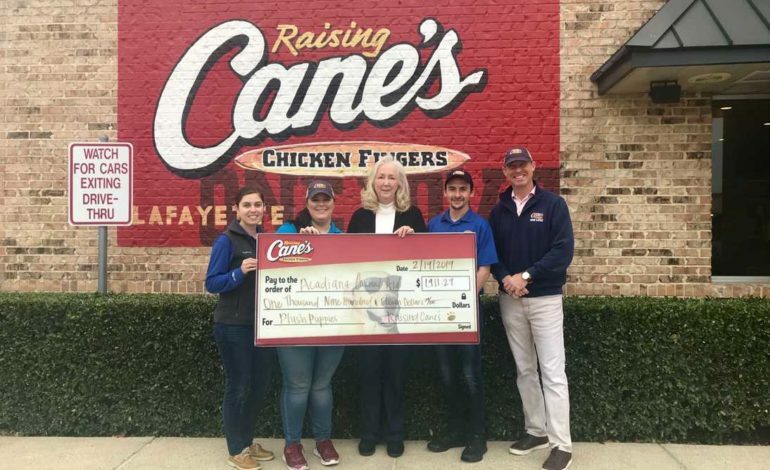 Raising Cane’s has recently donated a cumulative of $3,865.41 during special check presentations to the leaders of these pet welfare organizations.